From the layman's point of view botanists seem more interested in describing a new species and making sure that the plant is well and truly dead by making a herbarium specimen of it! Rarely do they seem to make an attempt to ensure that this plant is introduced to horticulture, and it is left to the collector in the wild to distribute the find. This has been taken to the extreme on occasions in the past and many specimens were removed from the wild endangering the plants' survival. A better way is to collect few and propagate before sale. 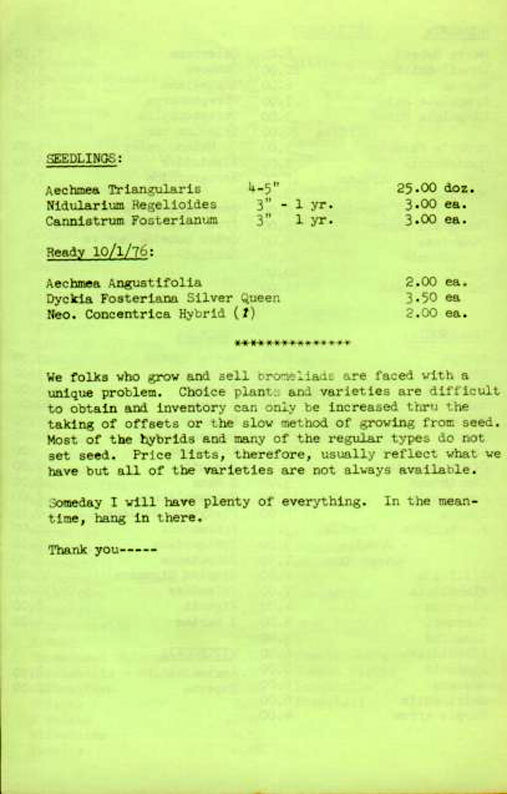 Some nurseries are or were just retail outlets selling collected stock but some did propagate before sale. All used to cater for the keen Bromeliophile who was always after that extra plant even though there was little space left in their garden, patio or even apartment room. This type of collector seems to be in decline which is reflected by the upsurge in sales through Super Markets where the choice is small but misidentification high! This trend can also be seen in that the numbers of specialist bromeliad nurseries is also on the decline. 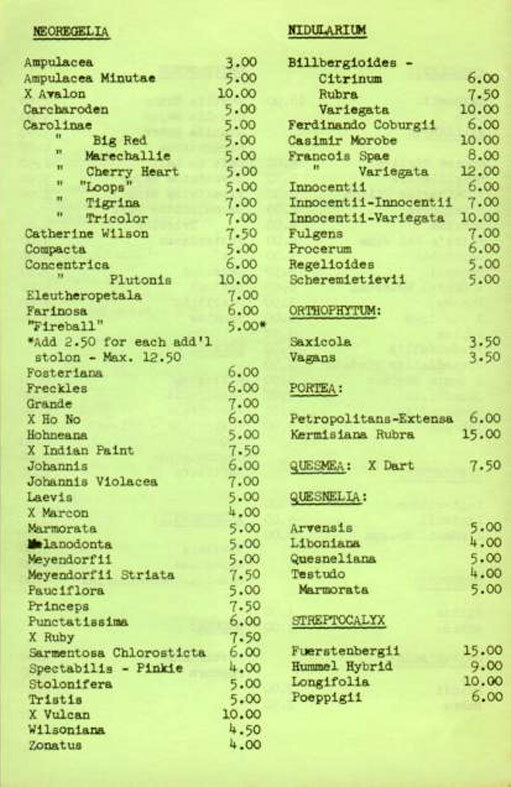 In 1972 there were 29 nursery advertisements in the JBS down to 18 in 1976 and down again to 5 in 2000! 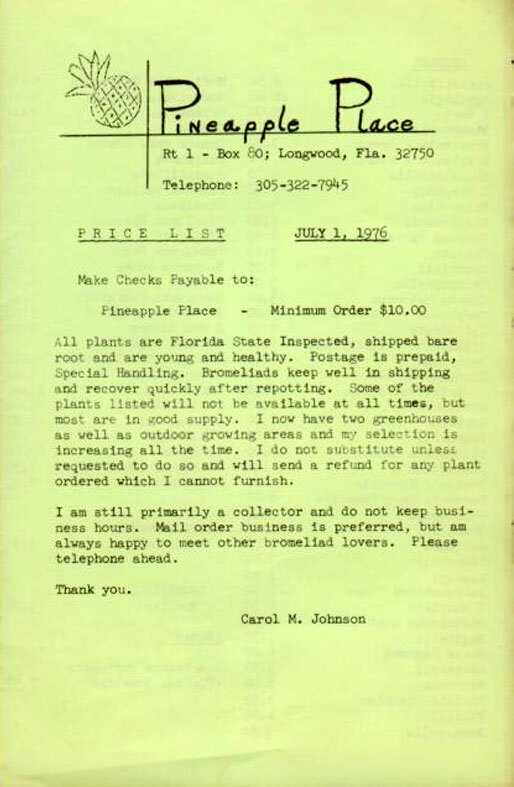 Pineapple Place was one of the specialist nurseries and one that did propagate species plants, as shown in their catalogue dated 1976. Plants in cultivation do not move as widely as the keen grower would imagine and the more wide-spread these specialist nurseries there are the better the dissemination of material. Therefore what can be rare in one area can be fairly common in another. 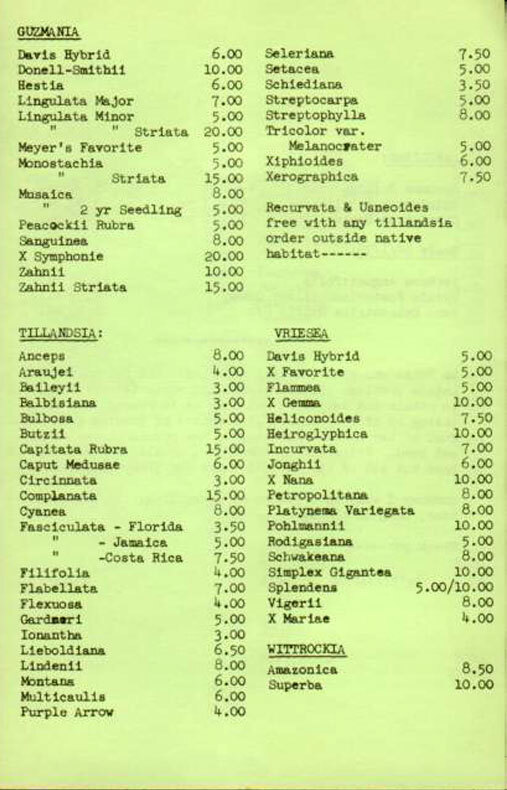 For example I thought it was great that Aechmea castelnavii, chlorophylla, lassieri, and pittieri were on offer in 1976. 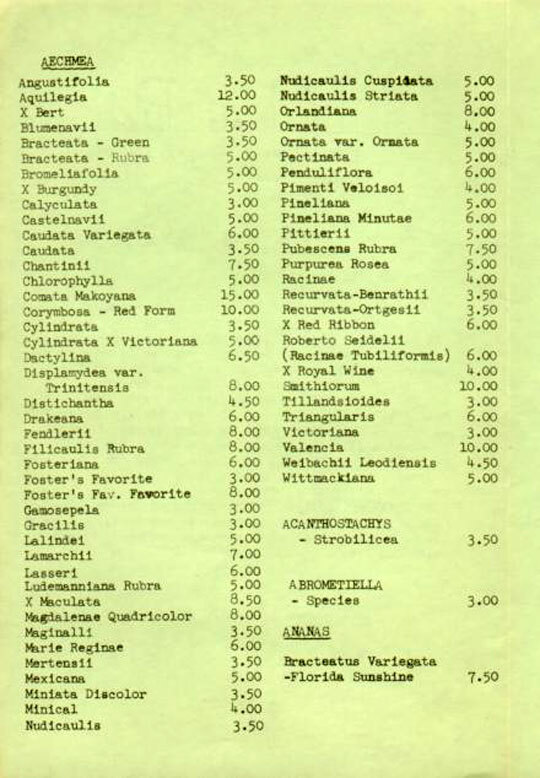 In 1976 there were 250 plants listed, up to 450 in 1980, and to 1000 in 1997. Quite a spectacular rise, somewhat clouded by the number of unidentified hybrids. Clearly this was dictated by the Customer's desire for something new! 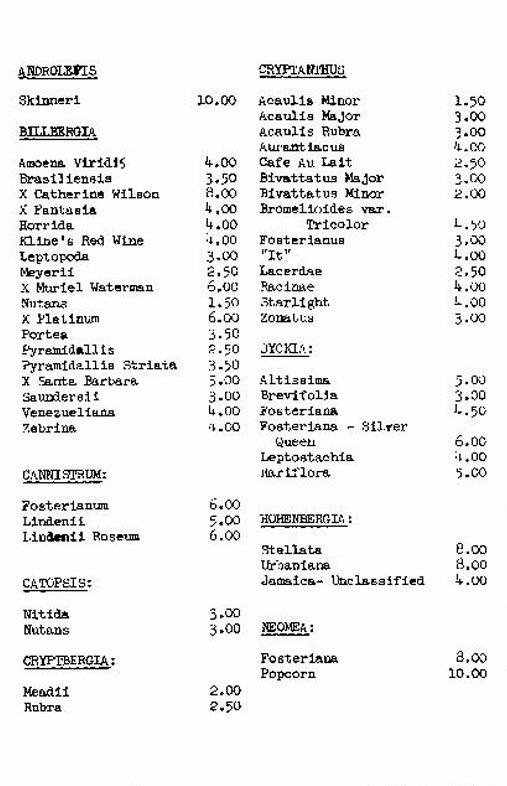 BUT the 1997 list did show "old" species names with Carol and Geoff clinging to their ideals without being totally convinced by the "New Order". Now, Pineapple Place is no more and it just adds to the decline in these specialist bromeliad nurseries. I believe it will reflect in an ever-decreasing number of BSI members who enthusiastically tend large personal collections. Perhaps the new BSI member will get his/her kick by surfing the Internet looking for that elusive Bromeliad rather than in the real world BUT then we may yet return to the Good Old Days!